Questioning Answers: Does a diagnosis of autism today mean the same as a diagnosis of autism decades ago? Does a diagnosis of autism today mean the same as a diagnosis of autism decades ago? I'm pretty sure that the findings reported by Olof Arvidsson and colleagues  are going to be a talking point for some time to come. Examining whether: "A decrease over time in the number of autism symptoms required for a clinical autism diagnosis would partly help explain" the increase in the prevalence of autism "reported to have increased worldwide", the authors relied on data from the parents of several thousand twins alongside other resources to look at this important issue. The Child and Adolescent Twin Study in Sweden (CATSS) and the Swedish National Patient Register (NPR) were the data sources included for study by Arvidsson and colleagues. CATSS is a telephone-based study where parents of all twins born in Sweden are asked to participate. Those who responded to administration of the Autism-Tics, ADHD and other Comorbidities inventory (A-TAC) were included in the present study (N~28,000 between 1992 and 2007). Alongside, participants diagnosed with autism or with an autism spectrum disorder (ASD) were identified in the NPR (N=430) and whittled down to some 270 children based on being born between 1992 and 2007. The study aims were three-fold: "(a) detect whether the number of ASD symptoms in clinically diagnosed ASD cases had decreased over time, (b) analyze whether any changes might be associated with age at diagnosis and (c) investigate whether individuals diagnosed with ASD in childhood would show variation in the amount of coexisting non-ASD problems and of dysfunction and suffering over time." Results: it looks like there were some important trends going through the years based on the presented data. Based on the A-TAC data defining an "autism symptom score", there was a steady decline in said mean autism symptom score over the years 1992-1993 to 2002. In every single year banding, the mean autism symptom score decreased, denoting fewer symptoms/features to be present. The authors concluded that: "Over time, considerably fewer autism symptoms seemed to be required for a clinical diagnosis of autism." And there's more. When age at diagnosis was divided up to form two groups - those diagnosed between 1-6 years of age, and those diagnosed later, between 7-12 years of age - for those diagnosed between 7-12 years of age the "mean autism symptoms score in the A-TAC decreased for 8.96 in 2004-2005 to 4.63 in 2014." No such significant change was seen in the 1-6 years of age at diagnosis grouping. The authors conclude that it could be this 7-12 year old at diagnosis grouping that seem to be driving the 'fewer symptoms needed for a diagnosis' finding, given that their older age at diagnosis potentially implies a less obvious autistic presentation or "with impairments stemming from 'comorbid problems." All of this is set within the context that registered ASD diagnoses went up and up and up during the periods being analysed. 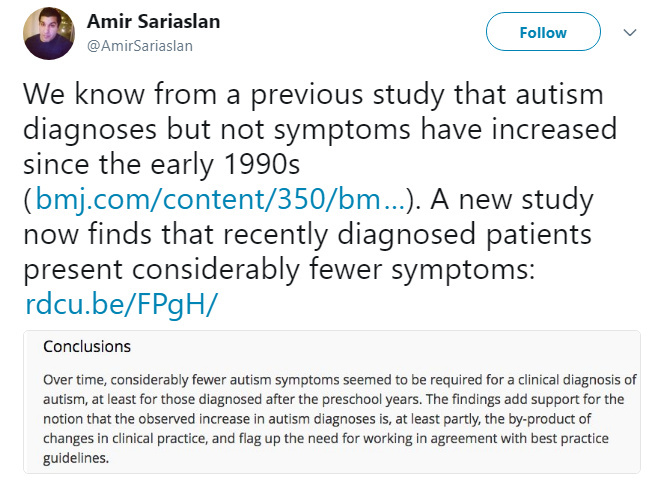 There's lots to take in from this research but I'll start with a quote from the authors: "the observed decrease in autism 'symptom load' in diagnosed individuals does not necessarily correspond to a decrease in the need for interventions and societal support." This was quite evident when authors looked at the data on comorbidity and "dysfunction/suffering scores" (yes, some people with autism do suffer as a result of their symptoms) that remained fairly constant throughout. Indeed, added to this, the authors talk about how there may be a "change in perception of what it is that is disabling" in terms of schools for example, requiring more "cooperation in groups and self-reflecting abilities." Overall symptom severity might be decreasing but the environment *might* be getting tougher in different ways? 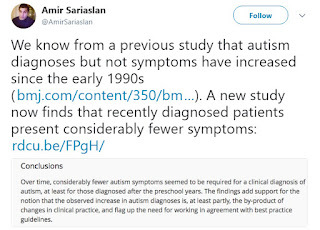 But it's difficult to brush these findings under the carpet and how they relate to the question titling this post: Does a diagnosis of autism today mean the same as a diagnosis of autism decades ago? On the basis of these findings, one would have to say perhaps not (in the general quantitative sense). More study is required however including on how 'female autism' *might* influence some of the patterns (see here) discussed by Arvidsson et al, alongside the idea that age and maturation might influence the often quite fluid presentation of autism . I'm also minded to reiterate that 'autism-related dimensions' are not always 'autism-specific dimensions' (see here) and the important studies suggesting that the presentation of autistic traits does not always merit a clinical diagnosis of autism (see here). Arvidsson O. et al. Secular changes in the symptom level of clinically diagnosed autism. J Child Psychol Psychiatry. 2018 Jan 29. Lever AG. & Geurts HM. Is Older Age Associated with Higher Self- and Other-Rated ASD Characteristics? J Autism Dev Disord. 2018 Jan 18. Lundström S. et al. Autism phenotype versus registered diagnosis in Swedish children: prevalence trends over 10 years in general population samples. BMJ. 2015 Apr 28;350:h1961.